The facial recognition has been a problem worked on around the world for many persons; this problem has emerged in multiple fields and sciences, especially in computer science, others fields that are very interested In this technology are: Mechatronic, Robotic, criminalistics, etc. In this article I work in this interesting topic using EmguCV cross platform .Net wrapper to the Intel OpenCV image processing library and C# .Net, these library’s allow me capture and process image of a capture device in real time. The main goal of this article is show and explains the easiest way how implement a face detector and recognizer in real time for multiple persons using Principal Component Analysis (PCA) with eigenface for implement it in multiple fields. Some facial recognition algorithms identify faces by extracting landmarks, or features, from an image of the subject's face. For example, an algorithm may analyze the relative position, size, and/or shape of the eyes, nose, cheekbones, and jaw. These features are then used to search for other images with matching features. Other algorithms normalize a gallery of face images and then compress the face data, only saving the data in the image that is useful for face detection. A probe image is then compared with the face data. One of the earliest successful systems is based on template matching techniques applied to a set of salient facial features, providing a sort of compressed face representation. Recognition algorithms can be divided into two main approaches, geometric, which looks at distinguishing features, or photometric, which is a statistical approach that distill an image into values and comparing the values with templates to eliminate variances. Popular recognition algorithms include Principal Component Analysis with eigenface, Linear Discriminate Analysis, Elastic Bunch Graph Matching fisherface, the Hidden Markov model, and the neuronal motivated dynamic link matching. A newly emerging trend, claimed to achieve previously unseen accuracies, is three-dimensional face recognition. This technique uses 3-D sensors to capture information about the shape of a face. This information is then used to identify distinctive features on the surface of a face, such as the contour of the eye sockets, nose, and chin. One advantage of 3-D facial recognition is that it is not affected by changes in lighting like other techniques. It can also identify a face from a range of viewing angles, including a profile view. Even a perfect 3D matching technique could be sensitive to expressions. For that goal a group at the Technion applied tools from metric geometry to treat expressions as isometries. Another emerging trend uses the visual details of the skin, as captured in standard digital or scanned images. This technique, called skin texture analysis, turns the unique lines, patterns, and spots apparent in a person’s skin into a mathematical space Tests have shown that with the addition of skin texture analysis, performance in recognizing faces can increase 20 to 25 percent. It is typically used in security systems and can be compared to other biometrics such as fingerprint or eye iris recognition systems. Emgu CV is a cross platform .Net wrapper to the Intel OpenCV image processing library. Allowing OpenCV functions to be called from .NET compatible languages such as C#, VB, VC++, IronPython etc. The wrapper can be compiled in Mono and run on Linux / Mac OS X. In my own words EmguCV is an awesome Wrapper, this let make very interesting things and tasks of computer vision, this library set let do an unlimited amount of wonderful projects in this field, EmguCV have many functions that let us work with CPU and GPU increases the performance dramatically with the latest mentioned. SURF feature detector ...between many others interesting tasks. EmguCV basics: How i start to work? flag: Mode of operation. Currently the only flag that may be specified is CV_HAAR_DO_CANNY_PRUNING. If it is set, the function uses Canny edge detector to reject some image regions that contain too few or too much edges and thus cannot contain the searched object. The particular threshold values are tuned for face detection and in this case the pruning speeds up the processing. How to Train the Prototype? I do this part the most easy possible, the prototype detect faces constantly (Each frame) and you can add this detected face in the image database with one label respectably, the face trained image will show in the imageBoxFrameGrabber and the process will be finished!! Keep in mind: The face recognition algorithms based in PCA (Principal Component Analysis) do multiple comparisons and matches between a face detected and the trained images stored in binary database for this reason And for improve the accurate of recognition you should add several images of the same person in different angles, positions and luminance conditions, this training do this prototype solid and very accurate. How to improve the recognition? The default parameters (scale_factor=1.1, min_neighbors=3, flags=0) are tuned for accurate yet slow object detection. Aditionally modify the 3rd param to 2500 or 3000 instead 5000, this modification do that the EigenObjectRecognizer be more strict/acurate. How to improve the performance for slower CPUs? All image processing algorithms demand many computational power, in this case the internals process carried on for the CPU with this sw prototype are so hard for slower o monocore CPUS, the Easy way for improve the performance of this Demo is modify the parameters that use the DetectHaarCascade method, these allow decrement the number of iteration, critic sections and Comparisons of the real time image captured for the Webcam improving notoriously the application performance. Keep in mind: reduce the values of these parameters will affect the efficiency of recognition Algorithms. For a faster operation on real video images the settings are: scale_factor=1.2, min_neighbors=2, flags=CV_HAAR_DO_CANNY_PRUNING, min_size=<minimum> (for example, ~1/4 to 1/16 of the image area in case of video conferencing). Also you may modify the Minsize parameter for a big value. The prototype does not show the strangers as unknown, Why? Is a limitation of Eigenface approach, isn't error, use LBPH algorithm instead(have pros and shortcomings) available on EmguCV 2.4.2 and above. What do you need to run/use this project without errors? I had many problems with vectors use with EmguCV, for this reason i had learn how use list of components like vectors and it really works for my project. I learn many of image processing, PCA and EigenFaces and to optimize the code, due to the huge demand of resources for part of artificial vision algorithms. What can you do whit this article and OpenCV? "Computer Vision: A Modern Approach" by Forsyth and Ponce (2002). "Computer Vision: Algorithms and Applications" by Szeliski (2011). "Digital Image Processing" by Gonzalez and Woods (2001). "The Essential Guide to Image Processing", by Bovik (2009). "Computer Vision and Applications: A Guide for Students and Practitioners", by Jähne and Haußecker (2000). This article and prototype is only for academic purposes, not use for commercial or public releases without author permissions. Muchas gracias por tu contribucion. Haz realizado mejoras, avances o upgrades al proyecto ? i mean how can we make him know that this person is the same person who recognized him before? Great it works at the first start! I am trying to implement face detection and recognition system using Emgu CV. 2. I have opened this project in visual studio 2017 and also follow all the steps mentioned in your article. But when I am running my project, the camera of my laptop is indicating that it is on but I am unable to see anything on the image-grabber area. I am using windows 10 64bit. and latest Emgu CV. and my laptop camera is in working condition I have tested it in example projects of Emgu CV lib. I am facing the same problem. If you know the issue now, could you please help. 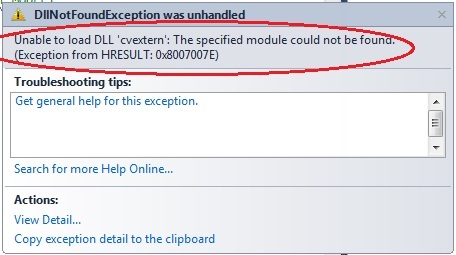 Sir what does this error mean? And how do we resolve it? how can i Create individual folder in saving faces in this projec? bro please help me i am getting error when i click on the Button "Add image" in the training option dont know what to do please sort out the problem i will keep remember you in my prayers. When I run the program then the webcam starts but black screen appears.Please help how to rectify the problem? What does 'Enable the face detection first' mean? Thanks for the post! I've got only one problem. When I click 'Add face', I get the massage 'Enable the face detection first'. What does this mean and how to get past it? Re: What does 'Enable the face detection first' mean? Encounter the same problem. What should I do to fix it? Add the folder 'TrainedFaces' to the bin/debug folder. Hi sir, I would just like to ask if where can i find the trained images in the project? Is it located in a specific folder or what? And what database are you using in your project. Please reply asap. Thanks! God Speed! First of all you have to create a folder named: "TrainedFaces" in bin folder of your project file location(i.e., Application.Startup) and in that "TrainedFaces" folder you should create a Text file named: "TrainedLables.txt". Is it need to make big alterations from the logic which I have now? How to detect all faces in a video? Hi Sergio, I have a requirement where we will have to blur (redaction of video you can say) all faces present in an uploaded video due to privacy concerns. Videos can range in length from 5 mins to 60 mins long. So my question is, using this lib of yours is it possible to do things with good performance especially speed wise? If not then, is there any other good n free alternative available in C# to do this thing?